Seen displayed originally at Tamashii Nations 2018 back in October, we finally have an update on what could possibly be the final S.H. 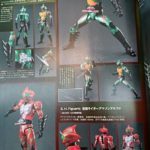 Figuarts release from Kamen Rider Amazons! The S.H. Figuarts Kamen Rider Amazon Alpha & Omega Last Judgement Set, has finally been officially announced after several months in limbo. Representing Amazon Alpha & Omega as they appeared in their final and ultimately deadly battle with one another, these figures are both decked out in literal blood splatter. They both took quite a few hits in that last fight after all. Though this set won’t bring anything else new to the table and will likely be reduced from the number of accessories each rider originally came with, it looks like it’ll be a great addition to any Amazons collection. The Alpha & Omega Last Judgement set will be released in July 2019 for 11, 880 yen as a Tamashii Web Exclusive. If you want to procure an order for this set, it’s best to keep an eye out with your preferred middleman service or seller in the near future. With images released at the same time as Gamera (1999), we also have our first set of official images for S.I.C. Kamen Rider Amazon Alpha from the Tamashii Pickup webpage! Revealed for the first time last week, S.I.C. Amazon Alpha joins the long legacy of the S.I.C. toyline and even calls back to the original basis for the Amazon Alpha design. Originally based on a S.I.C. figure itself, the Pre-Amazon S.I.C. Hero Saga figure, this new figure captures the wild spirit and ferocity of Takeyama Jin. S.I.C. Amazon Alpha will be released in October 2018, as a retail release, for 8640 yen. › Companies: Tamashii Nations, Bandai Japan › Characters: Kamen Rider Amazon Alpha › Show: Kamen Rider Amazons › Toyline: S.I.C. 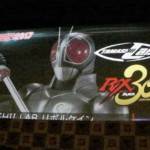 SIC Kamen Rider Amazon Alpha Details Revealed! After a brief teaser image earlier this week, we at last have a full reveal for the next Super Imaginative Chogokin release- Kamen Rider Amazon Alpha! The SIC series is ideal to replicate the new design styles seen in fan-favorite streaming series Kamen Rider Amazons and Alpha has been recreated in exquisite detail. SIC Amazon Alpha is currently scheduled for release in October 2018! The price for the standard release is a very modest 8640 Yen before shipping and handling! However, a second run will be released exclusively to Amazon Japan and include a special stand, for a mere 10800 Yen. Jin Takeyama has become a broken man in the years that have transpired between seasons of Amazons. He’s lost the love of his life, he’s hunted for the son he knows to be a monster, and now he’s blind. A broken man, on a mission to kill all Amazons, Jin won’t let anything including the loss of his sight stop him. S.H. 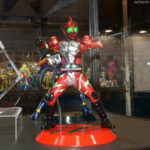 Figuarts Kamen Rider Amazon Alpha 2nd Season Version recreates Jin’s broken and battered form for the first time for collectors. A straight repaint of the original Amazon Alpha release, the Season 2 Version markedly de-saturates Alpha’s color scheme overall. It also adds a nice dark paint wash to bring out the details and scars on his suit. A subtle application of Amazons Blood splatter is even applied, while the most obvious difference are the new milky white Blind compound eyes. And while this Alpha includes all of the same accessories that came with the original we also get one brand new part, an Amazons Heart. We’ve attached the full 60 image gallery of Season 2 Alpha to this post. You can also read through our complete review in the attached gallery thread. 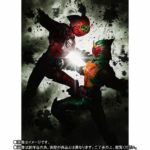 Just click “Discuss on the TokuNation Forums” at the bottom of this post. We’ll be back with more galleries ranging from Pacific Rim, Kamen Rider Kabuto, and even Choujuu Sentai Liveman, SOON! It’s that time again! 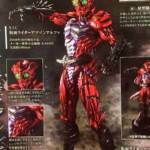 The newest batch of magazine scans from Japan have revealed the forthcoming Bandai Tamashii Nations solicitations for November/December 2016, and this batch of S.H. Figuarts looks like one that will go down well with fans. First up are the eagerly anticipated Kamen Rider Alpha and Kamen Rider Omega from Kamen Rider Amazons. Both are retail release figures, with Omega arriving in November and Alpha following in December – both priced 5616 yen. Interestingly the scan also makes reference to an exclusive Amazon.jp version of Omega also due in November and priced 6696 yen. What differences this figure will have are currently unknown. Next is S.H. Figuarts Zoffy, Ultraman‘s superior and officer in the Space Garrison! Previous Ultra-Act versions of the character became extremely sought after, but this will be retail release in November and cost 5940 yen. Look out for more magazine reveals over the coming few days and be sure to check out the full-sized images after the jump!